TAMPA, Fla. -- Three men, three different careers, three different lifestyles, but one foundation that allowed them all to grow -- the University of South Florida. The three College of Arts and Sciences alumni, T.J. Nutter, Emilio Gonzalez and Howard Gruverman, were given a tour around their alma mater and took part in a panel discussing their career accomplishments and their experiences at USF. The panel discussion was moderated by the director of the School of Mass Communications, Fred Pearce. Each man had his own story to tell. Nutter graduated with a Bachelor of Arts in Communication in 1998. After graduation, Nutter became the director of operations at John Cannon Homes Inc. His growth in the construction industry then led him to become the chief operating officer. Nutter offered advice for current students. "Define what your goal is, what your definition of success is and keep your eyes on the prize," he said. Gonzalez graduated with a Bachelor of Arts in International Studies in 1977. Since then, he has been around the world and back. Gonzalez's résumé could go on forever, however, most notably he has served as director for Western affairs at the National Security Council, served in the U.S. Army for 26 years, is the president and CEO of Indra USA and recently received the 2010 distinguished alumnus award from USF. Gonzalez said that people must come back to a foundation and that his foundation is USF. When asked about letdowns in his life, he had a good story. "I applied to be the department head in the Department of Social Sciences at West Point, and I was turned down,” he said. A couple months later I was called by Condoleezza Rice to see if I would go work with her at the White House." 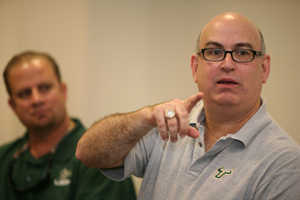 Gruverman began classes at USF in the ‘80s and left school when a job became available. He then returned in 2007 to finish the remaining classes to complete his Bachelor of Arts in Communication. Gruverman commuted from Ft. Lauderdale every week to finish his degree. Now the CEO of Edify LLC, a company based around the health, wellness and fitness industry, he spoke about the importance of family and keeping a healthy work-life balance. "What really matters to me now is that I spend quality time with my family, make memories with them… I'm friends with all the people I work with. We all care about each other," he said.